We bring forth Instrumentation Cables that are appreciated for the features such as high performance and superior quality among the clients. We offer Instrumentation Cables in various specifications to meet the requirements of the clients. We provide these Instrumentation Cables at competitive prices to the clients spread across the globe. Since our establishment, we have been providing our valued clients with superior grade Instrumentation Cable. 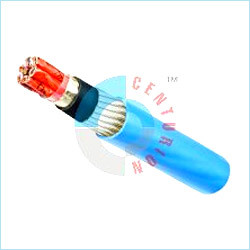 These cables are widely applauded for their excellent strength and quality finish. These are manufacture following all the parameters and norms laid by the industry. Supreme grade materials are used in the manufacturing process to protect the cables from heat and water. The Instrumentation Cable is available in many lengths and specifications to meet the various needs of our clients. Conductor - 0.4 mm dia (0.126 Sq.mm) to 2.5 sq.mm. or higher sizes of electrolytic copper wire, Tinned/ Bare, solid/stranded copper conductors. Insulation - 70/85/105oC. Grade PVC, Polyethylene, Halogen Free FRLS Polymeric Compounds. Elements - Pairs/Triples/Quads, colour coded/number printed ring marked/dual colour extruded. Shields - Aluminum Polyester tape screen with Copper drain wire or alternately with with Copper wire braiding. Individual element or overall shielding as specified. Element laying - Concentric formation or unit & group formation as per applicable specification. Amounting - Galvanized steel wire/strip amount. Sheathing - PVC 70/90oC. grade, PVC FRLS, ZHFR, CSP, PCP, EVA, etc. Specification - BS:5308 (1 & 2), iec-189 (1 & 2), VDE 0815, ENI 0181.00 and customers specifications.